The sailboats are hoisted on cranes back into the water after winter storms raised lake levels. 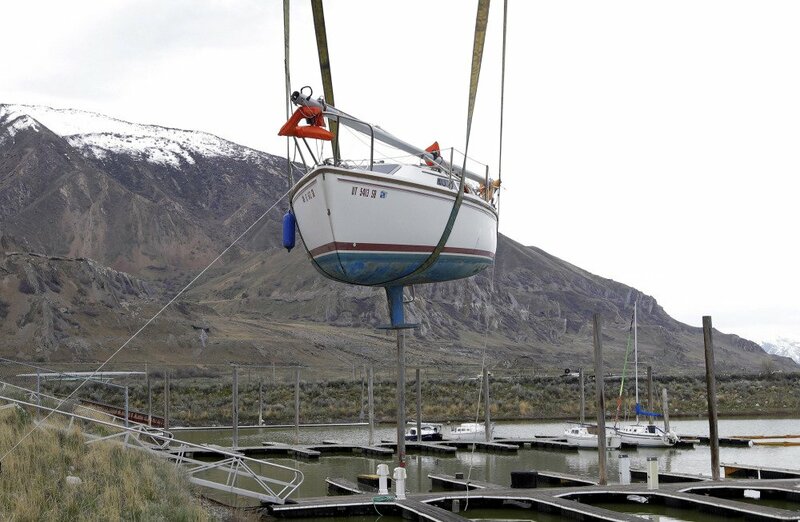 SALT LAKE CITY — Dozens of beached sailboats that spent two years on the shore of Utah’s drought-stricken Great Salt Lake were hoisted on cranes back into the water Thursday after winter storms raised lake levels. Robins and other sailors watched and helped on the docks Thursday as sailboats were raised from their high and dry purgatory in the marina parking lot, carried across the sky on a crane and lowered into the water. The Great Salt Lake, about 75 miles long and 30 miles wide, is America’s largest outside of the Great Lakes on the Canadian border and its waters are about three to five times saltier than the ocean. It’s a harsh environment for most creatures outside of salt-loving brine shrimp, but the mineral-packed lake is a sailing haven. The dense water isn’t easily whipped up by wind, keeping it calm for sailboats gliding across.